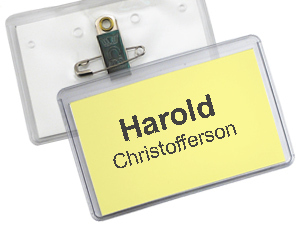 Networking is easy when your meeting, business seminar or conference provides badges to display the wearers name and title. 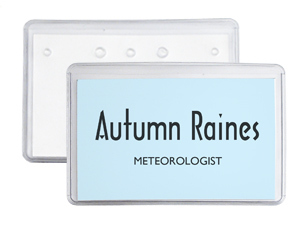 The smaller size of these badge holders makes them comfortable to wear while still offering enough room to make the information large enough to read from across the room. 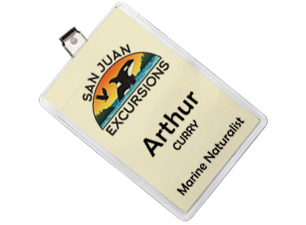 The outer measurements of the badge holders vary slightly, all of them use a 2.25x3.5 inch insert. Minimum Order: 25 badge holders. 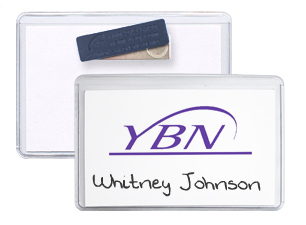 Great prices on the quality badge holders for your meeting, conference or trade show. Perforated, 8.5x11 inch, 67lb card stock. White and 7 colors. Sold in packages of 10 sheets with 8 inserts per sheet. (80 inserts per package). 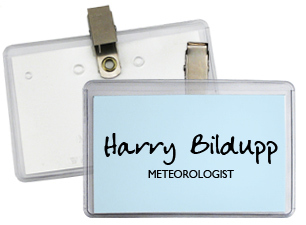 Add a finishing touch to badge holders with custom or standard lanyards. 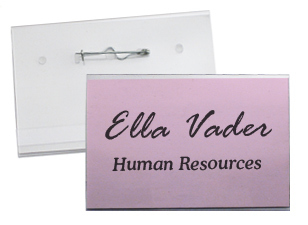 Identify those with special roles by attaching a ribbon to their badge holder, displaying their title or position. 50+ stock titles are pre-printed and ready for shipping. Custom titles may also be ordered. If you don't see what you want give us a call and we'll help you find it. Large selection – Low prices! PRICE INCLUDES:Prices shown in this chart are the price per badge. Printable inserts sold separately. Shipping costs will be displayed in the shopping cart. 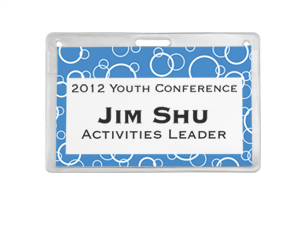 Minimum Order: 25 badge holders, this product must be ordered in multiples of 25. 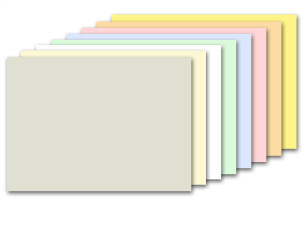 PRICE INCLUDES: Blank Paper Inserts are sold by the package: There are 8 inserts per page, 10 sheets per package, for a total of 80 inserts. Shipping costs will be displayed in the shopping cart. PRINTING USING THE TEMPLATE: Save the template to your computer, open the file to enter your names and titles and print onto the insert sheet using an inkjet or laser printer. 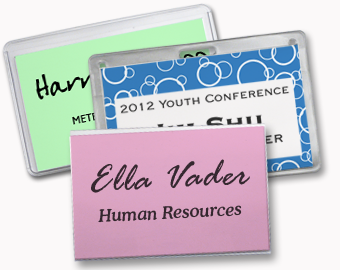 Name Tag, Inc. is not responsible for any damage to your printing equipment. Please review your equipment manual for product suitability. Additional information on using our templates is available in the Resource Center on the Insert Printing Page; including how to use our templates, links to all available templates and simplified instructions on how to set up your own templates using mail merge. This information is offered as a resource; you are responsible for your own results, and we do not offer technical support.